I believe the Lord has given me a clear vision on how to inspire and empower regular church going Christians to share their faith online. I envisioned my ministry responsibilities to soon have a significant portion dedicated to these efforts. Nearly a year ago, I started sharing this vison, by starting this blog (http://webevangelist.blogspot.com) and http://internetminister.org (- a great place to learn about Internet Evangelism and Internet Ministry.) I was encouraged by the response to these efforts - I still find it amazing to have someone on the other side of the world contact me and thank me for encouraging them in the Lord in some way. However, to this point I have not had any mission committees or Christian Individuals capture the vision to support these efforts financially. I really believe "where God guides, He provides" so I have patiently sought the Lord for direction to see if these are my plans or His. I still clearly feel that the Lord is calling me to share the vision/burden he has placed upon my heart. Many times in my life the Lord has revealed to me a clear direction or vison of ministry and I just had to hold on to it until it was His timing. Many years ago the Lord placed upon my heart the concept of having an area-wide event called "Taste of Reconciliation". This event would promote unity and cooperation in the body of Christ... It would consist of a time of first - food and fellowship - free ethnic food of various types, games, and various cultural haritage booths, followed by a multi-cultural worship service (along with a good message from the WORD) . For 3 - 4 years I shared this vision but no one seemed to get excited about it. Finally I found a partner to team up with (Living Springs Community Church of Glenwood, Illinois) and last Sunday I'm gald to report we had our 4th annual "Taste of Reconciliation". Five to six hundred people or more showed up and we had a powerful service where it was not just a fun musical but a time where God touched and inspired hearts in a deep and significant way. For some time now I have been pleading with "church folk" about the importance of Internet Ministry and how we can empower congregations to invest a small portion of their week sharing their faith Online instead of watching T.V. Cults, false religions, te rror organizations, etc. are using the Internet very effectively for their causes... In this time of uncertainty and fear, we have wonderful, urgent, GOOD NEWS, to share. We have a very inexpensive medium to get it out - the Internet! We now have the capacity of empowering "lay people" to share their faith to some of the ONE BILLION souls online. For some reason, I have not yet connected with those who see this vison and would like to team up to see it happen. I believe God has given me insights and skills on how to see this happen, yet In need to wait for God's timing and provision. * Many of you may have noticed that I have gone several months without posting a blog or further developing our websites. This summer I have been dealt several special & difficult circumstances - health issues, house & vehicle issues - seems like everything is breaking down, family issues, a need to provide an adequate income for my family etc. - so I have had to make my faimily and a few other things the priority in my life. So at this time, my "Internet Ministry" time is limited - yet since I believe my time limitations is due to obdeience to God given responsibilities, that God will continue these efforts (If they be of God and Not Scott Reese). It has been interesting to see that during these past few months while I have had hardly any time to invest in these efforts, that I have received probably about 30 to 50 requests from people who are interested in our Web Evangelism efforts (possible volunteers). * It is amazing ... yet I still have some pressing family needs which will not allow me to invest much time in these Internet Ministry efforts for a while. I know a key to having a good blog is consistent writing and I am looking forward to agressively get this up and going again, in God's timing. 1) Pray for these efforts 2) Pray that if it be the Lord's will that He will also provide the funding and the clearing of time in my schedule for these efforts 3) Consider how you can help Phase Two become a reality. 4) While waiting, continue to learn about internet evngelism by following the links on our sites 5) While waiting, for our "PHASE TWO" - explore some other good Internet Ministries (see my previous post) and see how you can get involved now and gain experience. 6) For those of you who do feel a pull in your heart to help in these efforts, please drop me an email about how I can best pray for you. It is my desire to empower those who team up with me, to your fullest potential for God,(& not just to be some short term volunteer in my big ministry scheme.) Although my time is limited, I do want to know, care, and share community those who I will be partnering with. Launch community websites (message boards etc.) for the various community groups or mission focus areas so Christian volunteers can start interacting with each other, and collaberating on how to go about developing their specific "Bridge Site". + A SPECIAL NOTE: Thanks to a gift from a concerned pastor, today I was able to attend "The Leadership Summit" / Conference produced by Willow Creek and Bill Hybels. I attended at Faith Church of Dyer, IN., where Bob Bouwer is pastor. ministering to your family as a priority over ministering to everyone else. Although I have been attempting positive change in these areas, my heart was really convicted. My family is at a unique situation where they need tons of time from their husband and daddy. Please pray with me that the Lord will grant me the faith and strength to come through for them. As far as this Internet Ministry, and my other ministry endeavors - I put them on God's altar - may His will be done. Web Evangelist Scott Reese - Internet Minister. We are excited to share that the "International Web Ministry Strategy" that we previously shared here in our blog is now a reality! We appreciate your prayers... God has given us many ideas and we're thrilled to see some of them now coming to fruition. *We are starting at two locations: Uganda and India! *We are now helping support fine local pastors in Uganda and India evangelize their communities and also teaming together to develop Web Ministry Strategies and Websites for evangelism and discipleship in India and Uganda. Since the 1800's and before, the Mission Strategy of most churches was to send missionaries throughout the world to establish churches and do the work of the ministry. This will always be a viable and important mission strategy. The world we live in has greatly changed and with these changes come awesome opportunities for sharing the gospel. There is a need for a major paradigm shift to effectively face these changes. There are three important strategies that a Mission Committee should consider while formulating an effective Mission Strategy in this new world. Reconciliation Resource Ministries uniquely has combined these three strategies into a single program that can be supported through designated funds to RRM. RRM's "International Web Ministry Strategy" incorporates all three mission strategies into one program. 1. SUPPORT OF NATIONAL / NATIVE MISSIONARIES. * National / Native Missionaries are better equipped for effective ministry. They better understand the culture, customs, and needs of the missionfield. They already have a network of friends and contacts established. They have a hunger and thirsting to know God and to serve them. The old prideful paradigm that native nationals are not educated enough for effective ministry MUST BE THROWN OUT!!! * it is much more cost effective to support native missionaries. Funds are limited. Consider that for the same amount of funds it would take to send and support ONE new American missionary in a foriegn land, 5, 10,15, OR MAYBE UP TO 75 FULL TIME MISSIONARIES CAN BE SUPPORTED. There are some mission fields where a full time missionary can be supported for only $60 - $100 a month! It depends on the region, but in much of the world, a full time national missionary can be supported for less than $700 a month. Let me use myself as an example, RRM is only able to provide me with a disaster Health Insurance plan ($7,500 deductible) for me and my family - yet this still costs $550 a month. For the same amount of money to pay for my health insurance coverage, 7 full time native missionaries could be supported at $75 a month, TO SHARE THE GOSPEL IN SOME OF THE POOREST AND MOST OPEN MISSIONFIELDS IN THE WORLD. Another example, I have a "friend" who ministers in a country where the cost of living is very high. It costs well over $100,000.00 a year for her to teach missionary children and to be a blessing to those she comes across. The same amount of money to support this one American Missionary, over 80 full time native missionaries could be supported at $100 a month, or 16 full time missionaries at $500 a month. * Please don't mistake what I am saying, "American Missionaries" are of vital importance, and need to continue to be supported! I also believe missionaries should be paid well. When someone is willing to leave the comforts of home and endure the dangers and hassels of the missionfield, the last thing in the world they need to face is financial pressure. When a missionary retires after a life of sacrificial service they should be able to retire in comfort. Workmen are worthy ... a double portion ... What I am saying is that in this world there is a huge disparity on the cost of living. Because of this disparity, full time native missionaries can be supported for a small monthly amount. Churches should consider adding RRM's mission strategy to their mission budget. * I just got off the phone with Pastor Mark of Uganda, you would not believe how excited he and his congregation are to be receiving $60 a month. They are praising God for my vision and willingness to partner with them - $60 a month, not 600 or 6000. We are in the midst of an new communication revolution. The basic ways people communicate, get information, are entertained, find friends and connect with community are all being changed by the Internet. Every day more people are turning to their computer (Internet) as their method to seek out news and information. Evil organizations and causes are using the Internet in powerful ways to further their causes. The church must not be left in the dust on this new technology. Nearly 1 Billion people are online now. Many American Christians just don't realize just how lost this world is! In much of the world "Christianity" is a small, misunderstood religion. Internet Evangelism provides a low cost method to get the gospel to the uttermost parts of the world. http://internetminister.org/ and it's links for information on Internet Evangelism. For too long there has been a lack of communication and cooperation between good Bible believing ministries. Denominational beliefs are important yet we must embrace and support the entire body of Christ. The eye cannot say to the hand, "I have no need for you, you are not in my denomination!" And the head cannot sat to the feet, "I don't need you, you are not part of my specific mission organization!" We need each other. We are teammates not competitors! Often there are mission organizations ministering in the same area, yet have no communication with each other. We must understand the urgency of the hour and unite under the banner of God's love. I had a friend to to Iraq to plant churches. In an area like that, when Christians cross paths, they don't spend their time and effort arguing about minor issues. They see clearly the great need of the Nation and work together. They pray for each other and encourage each other. A priority should be give to our own particular denomination's mission efforts, yet we must also keep our eyes open on the big picture and have a willingness to strategically work together. Reconciliation Resource Ministries combiines these three mission strategies into a single program. We call in our "International Web Ministry strategy" and is supported by designated gifts to Reconciliation Resource Ministries, a 501c3 Christian Non Profit Organization. We are now launching this pilot program and would appreciate your prayers. We would also love to expand this program as soon as we receive a commitment for more designated funds for this project. We are still working out the details but we are starting with two missionary families, one in India, the other in Uganda. Since both of these missionary families serve in areas of possible persecution we will not place their last names on the Internet. Those who actually support this project through designated funds will be able to actually be in first hand communication with them through email and phone. While ministering in the Roseland area of Chicago, I had a devine appointment - As I walked out the door of a church I was helping, I saw Bishop Leonard. We talked and I soon found out that he was a minister from Uganda who now was ministering on the North Side of Chicago. We talked and prayed together. I shared with him this mission strategy and have met with him several times discussing it. He has many close contacts in Uganda and visits there regularly. He will help oversee our Uganda Teams. He is an amazing guy, he speaks three languages: English, Luganda, and Chinese; and has been a minister for over 25 years. Mark and Ruth minister in the city of Kampala, Uganda. Mark is planting a church. The congregation is now at about 30 and they meet at a local school. They are very active in evangelism and also meeting the felt needs of their community. The church has 4 services a week and the also regularly send out a team to distribute food and to visit those in the hospital. Ruth works for a Christian organization in town and has access to the Internet there. Lucy also has a B.S. in Communication Skills and speaks three languages: Luganda, French, and English. Lucy will be working with me (Scott Reese - http://internetminister.org/) to develop strategies and websites to minister in Africa. They are a wonderful, dedicated Christian couple making a difference in Africa. We have raised a designated amount of $100 per month for our Uganda Mission Team. We are grateful to Living Grace Church for pledging $80 per month and an individual $20. $60 per month to Mark and Lucy to help suppliment their income and provide for special ministry needs. $15 per month to Bishop Leonard for his help in encouraging and overseeing our Uganda team. $25 per month towards the expenses of developing and promoting an Uganda Web Ministry as well as covering the transfer to wire the money to Uganda. We hope to increase funding and also would like to open an "Internet cafe" in Kampala. For information on what an "Internet Cafe" is, see John Edmiston's website at http://cybermissions.org/ . We plan on updating you on this project as well as share special needs. We do have an immediate need of an additional $25 a month to purchase an internetional calling cards to help us in our communication efforts. Although we are looking into Internet phone service options. I met Pastor Jacob at the Internet Evangelism Conference in Chicago this past September. He spent many months in America raising funds for his ministry efforts in India. Since he spent most fo his time in the Chicago area, I was able to spend a bunch of time with him and develop a deep friendship. We are starting India ministry support at $110 per month. We are grateful that an individual donated the designated funds for March and April to help jumpstart this project. We are praying that a church or a few Christians will be willing to take on this commitment starting in May. $45 a month to pay for the Internet Expenses of pastor Jacob. In return, Pastor Jacob will help me develop some ministry websites targeting India. Pastor Jacob will also help over see our team efforts in India, starting with a minister named Murma. $60 a month will go to missionary Murma. Murma is a dedicated servent of the Lord. He has a wife, Rita, and a daughter. He ministers in one of the poorest areas of India. Murma does not speak English. Murma is very dedicated to evangelizing India and has paid a terrible price for his efforts. Several years ago he was passing out gospel tracts on a train. Religious extremists then attacked Murma and threw him off the train. To this day Murma has lost much of the use of one of his arms as a result of this incident, yet he is not bitter, only more determined to serve his Savior. (We should remember Murma when we feel fearful to pass out a tract. I also want to add that I believe that passing out tracts and witnessing to strangers are not outdated forms of witnessing. There seems to be such an emphasis on feel good Christianity that personal evangelism is looked down upon as something only for radicals. People are so afraid they might offend someone by telling them the truth. To me it's like someone knowing that a bridge is out but not trying to flag down any approaching cars in fear of being misunderstood. Anyway we would like to increase this support and we are praying that the Lord will raise up someone to continue to make our efforts in India possible. There are many other needs for our India team and there are a host of other National Ministers we'd like to empower as the Lord provides. 10/16/2011 PS- I now work for Christ Cares not RRM - Also we may choose to work with other missionaries, but the concept is still good and in place. Please see additional information included in the "comments". Also, missions, missionary, missionaries, native, national, christian, Internet Evangelism, Web Evangelism, witnessing, are search terms to help people find this post. Internet Evangelism Day is May 7, 2006. Internet Evangelism Day is A worldwide focus day to help the Church understand effective strategies for online outreach. Internet Evangelism Day is sponsored by the Internet Evangelism Coalition. Please pray that the Lord will use this focus day to increase understanding of and participation in Internet Evangelism. Web Evangelist, Scott Reese, along with http://Internetminister.org will be providing free church bulletin inserts that explain Web Evangelism that can be passed out on this strategic day. For those following our ministry, this would be a wonderful opportunity to share with others our Internet Evangelism efforts. We have websites that explain various aspects of Internet Evangelism and we will also have http://bridgesites.org live by I.E.Day. At bridgesites.org many practical opportunities will be listed for individuals to get involved in online web evangelism. Are you searching for information on how to be a Christian? Possibly you are curious about Christianity but you really don't have anyone to talk to about it. Not only will you find helpful information, you will be put in contact with a Christian Minister who would love to personally explain not only how to be a Christian, but also help with any other religious questions you may have or situations you are facing. Whether you are lonely and just need someone to talk to, or if you would like to discuss problems you have with Christians or Christianity, please go to http://howtobeachristian.org . Ask God to reveal himself to you and determine that you will seek after truth... God is real and He does care... and He will reveal Himself to those who seek after Him with an open mind. The Bible says in John 3:16, "For God so loved the world that He gave his one and only Son, that whoever believes in him, should not perish, but have everlasting life." Christ also said that He came to give us abundent (fulfilling) life and a deep abiding peace that can not be fully explained, only experienced. Christianity is about restoring your relationship with God. It is not just a list of creeds to open and sins to avoid. Our prayers are with you... please visit: http://howtobeachristian.org now. "How to be a Christian", "How to become a Christian", Christianity, questions about God, questions about religion, "why", "what", proofs, problems, faith, "born again", salvation, saved, are all search terms to help people find this post. Other news: Official Launch Date for http://internetminister.org and http://bridgesites.org will be Thursday, May 4. Funny but true: Yesterday a search on google found 10,900,000 results for WEB EVANGELIST and we had the number one ranking! Internet Ministry, witnessing, missions, web evangelism, web evangelist, Internet Evangelism, are terms to help people find this article. A quick note for those following "the Adventures of a Web Evangelist". My family is facing some health related emergencies - I'd appreciate your prayers. I'm really stretched, hope to finish up www.internetminister.org this month. Fund Raising, ( i.e. support raising & "friend raising"), is a challenging responsibility most missionaries face. Most missionaries would prefer to invest their time and energy into the work that God has called them into. We would like to be like George Mueller who never sent out an appeal letter - he simply prayed and God miraculously provided. We also realize that sharing what we are doing can have many positive effects. It can bring increased awareness and involvement into our particular mission field. It can also garner the prayer of multitudes, which is the foundation of any truly spiritual work. Sharing our mission can inspire others to take up the torch and become missionaries themselves. I can remember as a little boy hearing a missionary speak and it really touched my heart. That night when my parents put me to bed I said, "mom, dad, when I grow up I think I want to be a missionary." The next day the missionary spoke again and also showed pictures of natives running around with machetes and it really scared me. That night when I went to bed I said "mom, dad, I don't think I want to be a missionary - a guy can get hurt that way, I think I just want to be a pastor like dad." I ended up doing both - I was pastor of an urban church for about 18 years. Anyway, a missionary sharing his mission can help open the eyes of people to see the great need of getting the gospel out to the lost. It can awaken their hearts and stir their spirit. Christ said to the disciples, "open up your eyes, the fields are ripe ready for harvest." Hearts can be stirred and challenged by a vision. A missionary sharing his ministry can inspire Christians who have been living in their Christian ghetto to open up their eyes. There is a big world outside the sphere of our Christian friends. We, as missionaries, must foster and encourage others to a closer personal relationship with Christ. Out of a passionate relationship with Christ comes a desire to make Him known: a desire to share one's faith and to support mission efforts. Any witnessing or mission giving that comes from other motives will soon fade away. I received a wonderful book in the mail today from the EFCA. It is entitled, "Growing Giver's Hearts - Treating Fundraisng as Ministry", by Thomas H. Jeavons and Rebekah Burch Basinger. It is a great book both for missionaries and for donors. It explores the dynamic interplay between encouraging spiritual development of donors and raising essential resources. 1. We must not manipulate others into giving. Using guilt or other motives to inspire someone to give is not right. Share what God has called us to do and let the Holy Spirit do the convicting. 2. We must not sell our ministry as being better than all other ministries. We must not have a scarcity mentality. God has enough resources for all that he has called into ministry. We must not look at our fellow missionaries as competitors. There is a wide variety of spiritual needs and there needs to be a wide variety of ministries to minister to these needs. 3. We must not promise anything we can not deliver and we should not twist the promises of God for our personal benefit. I've seen some ministers promise if you give money to their particular ministry that you would get 100 times that amount back, or that any prayer request you make would be answered. I've always wondered if they truly believed that why don't they give all their money (including their Mercedes and Lexus) to another Christian ministry and receive 100 times back what they gave. Why if they did that a couple times they'd have enough money to buy the private jets etc. that they need and wouldn't have to beg senior citizens to give $25 dollars. Giving from a grateful heart is a personal expression of love to our wonderful savior - it is not a guaranteed slot machine. It is a way to participate in the mission of getting the GOOD NEWS to the lost and we will be rewarded. Jesus said, "Lay not up for yourself treasures upon the earth, where moth and rust corrupts, and where thieves break through and steal: but lay up for yourselves treasures in heaven, ... For where your treasure is, there will be your heart also." (Matthew 6: 19 -21) . Giving affects our heart - it is an act of faith of trusting in and operating in God's ways and not the fleshly, lustful ways of this world system. It is in this context that Christ says in verse 25 that, "No man can serve two masters: for either he will hate the one, and love the other ... You can not serve God and money." I like what Paul said to his faithful supporters in Philippians 4: 14 - 20. "But it was right and commendable and noble of you to contribute for my needs ... I do seek and am eager for the fruit which increases to your credit...They (the offerings) are the fragrant odor of an offering and sacrifice which God welcomes and which He delights. And my God will liberally supply your every need according to His riches glory in Christ Jesus. To our God and Father be glory forever and ever. Amen. - Amplified Bible. 4. We must not exaggerate but portray the truth. There is a tremendous pressure put on missionaries to produce and to be judged by modern business standards of success. There is an emphasis on numbers and statistics. It is important for a mission organization to be transparent in its ministry efforts. It is also important for donors to use wisdom and the spirit's guidance while evaluating. Jeremiah was so "unsuccessful" for a while that not only were the people not heeding his message but they also put him in a pit. 5. We must not cry "crisis" with every communication. Several years ago I evaluated my quarterly newsletter. I noticed an emphasis on the various crises we were facing. I realized partly through the post traumatic stress of going through about 100 murders of people I knew and various dangerous and high pressure situations - the majority of my newsletter was focusing on all these terrible things and the various crises we were facing: How we didn't have enough money to provide activities for poor children while some local drug dealers were spending $5,000 a pop for activities for the area youth. Very little space was given to the souls that were being saved and to the kids who were making the right choices in life. I've tried to make the adjustment. Everything is a matter of perspective. I have been raising support as a missionary (http://christcares.org) for 20 years. It has been especially difficult the past couple of years. It looks like adding Internet Evangelism as major component of our ministry is causing concern with many of our key supporting churches. Either God will raise up new supporters soon or it looks like I will need to find a secular job in order to provide for my wife and two girls. I do believe the best investment of my time is in full time ministry for my savior. I am praying that God will touch hearts of individuals and churches to partner with our ministry. It is my prayer that this strategic ministry would get my full time efforts and that we would be able to develop a mighty team of Christians sharing their faith online (while still continuing some strategic urban ministry). I want to do God's will whatever that may be. I have sacrificially ministered to the poor all my adult life and now I am excited about adding another strategic endeavor for the kingdom. I have a B.S. in Pastoral Theology and a Masters in Ministry. I believe I have valuable experience, knowledge, and gifts that can be used for God's glory but I need to be willing to follow HIM whatever the cost. I also realize that in the whole scheme of things that my desire to raise funds is not a crisis. Those Christians who live in places like Sudan, Indonesia, etc. who are being persecuted and even killed for their faith - they are in crisis. The majoirty of the citizens of the world who make less than $50 a month - they are in crisis. The majority of the world who have never heard a clear presentation of the gospel - they are in crisis. Although it is not a crisis I would deeply appreciate your prayers. 6) We must ask God to keep our motives pure. Christ said in Matthew 6 that when we do our good deeds not to "sound the trumpets" to be seen and praised by man. We should do them in secret unto the Father who sees in secret. There is great pressure to grab the camera and printing press to proclaim to our supporters the good deeds being done. Prayer for wisdom is needed to find the right balance between the important need for donors to see what is happening and also the need to not take personal credit for the good works being done. When ministering to the poor there is also another issue that is hard to describe but it is sometimes demeaning to a person to photograph them while they are in the depths of poverty and depression. We need to share past victories and yet not put ourselves on a pedestal. At the age of 13 I began to aggressively share my faith in poor gang filled communities. God has worked many miracles and has changed many lives. We started a church in a government housing project living room without any outside support. One of our first pulpits was a chitlin bucket with a towel over it - yet our mighty God blessed in powerful ways. Some years later God provided us with a facility with a replacement value of over a million dollars. We got this building for only $25,000 - it included a full court gymnasium, large auditorium, kitchen, dinining hall, and about 16 classrooms and offices. They (the Midwest Baptist Conference) gave us a no interest loan and allowed us to make monthly payments of whatever we could afford. It is important for donors to know that for over 30 years I've been faithfully sharing the GOOD NEWS to the poor. It is also important as I share the highlights of the past 30 years that I don't give the impression that there hasn't been any "lowlights" that I'd rather not share. As a missionary we can build our identity around our calling. For myself personally, I got to the point where I saw myself as a very strong and brave individual. I went through a difficult burnout stage where the LORD pointed out to me that in reality I was weak and fearful. Yet praise be to God, in our weakness HE can become our strength and refuge. In our weakness we become strong as we give GOD the glory due him. "Through God we shall do valiantly." As missionaries, we must openly share that we too are frail and have moments of despair or panic. I believe some are intimidated from pursuing Christian work because the Christian leaders they know are not transparent and they feel they wouldn't be able to measure up to this awesome piety. Next week I will be sharing the exciting vision of internetminister.org and various ways you can team up with us and support this strategic ministry. In preparation for this I thought it would be good for me to prayerfully evaluate how to make such an appeal and also put it in print - maybe it could be a help to some of my fellow missionaries. God bless you all - Scott Reese - web evangelist & internet minister. Internet evangelism, internet ministry, christian blogging, missions, ministry opportunities are all terms that will help people find this article. The World-Wide-Web has grown to an astounding 1 billion users! Most of these 1 billion users are seeking for spiritual answers yet have not had a clear presentation of the GOOD NEWS - in spite of our weakness, faliures, and sin, God still loves us and has provided a way of salvation. There are millions of "Christian" websites, yet the vast majority are designed for those who ARE Christians. How do we get the gospel to these millions? 1) Design websites for those who are seeking spiritual answers (see http://godinfo.info) . 2) Create bridge sites to provide opportunities to build relationships with the "lost" and to share the GOOD NEWS with them. More info on this can be found at: http://internetministry.info . These web evangelism strategies do not absolve us from our responsibility of sharing our faith with our neighbors, co-workers, and through our church's outreach programs. Web evangelism is an exciting additional for us to witness. I believe the local church must stay central in all evangelistic efforts. It is important for converts to immediately be connected with a solid Bible-believing church. I also believe that local churches should now add Internet Missionaries as an important part of their mission strategy for the 21st century. http://BridgeSites.org is under construction and we need your help. We need volunteers to help develop these sites and others... we will team you up with other Christians with similar interests. We soon will be listing specific ways you can help. For now we are creating a list of those who are interested in helping in some capacity. We would also appreciate your prayers that God will meet our financial needs for these efforts. We are also creating a database of good bridgesites that are already developed... if you are aware of any please post them as comments or email me : Scott Reese , Scott@internetminister.org . Nearly 1 billion people use search engines to surf the net. They search for their interests and we want to create quality sites that they will find. If you have not done so yet, please read my post on the synergy of combined passions. Some of you have expressed interest in our International Web Ministry Strategy . I would appreciate your prayers, this week we are speaking with several key people for this project. There is a new resource for those interested in learning more about evangelistic Christian Blogging. The material was provided by Tony Whittaker and his Web-Evangelism guide. You may find it at http://blogministry.org . Blog evangelism, blog ministry are important strategies of getting the gospel out. Working as a team can be a lot easier and more effective than doing one by yourself. We would like to train you and team you up with some like-minded Christians. Most blogs are geared for Christians - we want to have some geared to the general public to serve as "Bridge Sites". As examples, we will be developing "myspaceblog.org" and www.googleearthblog.org . This can be fun because you will choose topics that fascinate you and that you enjoy. It is also fun to be a part of a team and to make friends with people who have the same interests and or spiritual passions. Sharing your faith does not have to be a drudgery done only out of spiritual obligation - Sharing your faith can be exciting and fun - It can bring purpose to your life as we were created to fellowship with God and to do his will. Sharing our faith is the greatest cause in the world! Many of us were blessed of God to grow up learning about God. Do you realize only a very small percentage of the world can say that? Christ said that "unto whom much is given, much is required." How can we keep the GOOD NEWS to ourselves? If we really could understand how good God has been to us - we'd be like Isaiah - we'd have a fire burning in our soul. We'd have a hard time keeping our mouth (or typing fingers) shut - out of gratitude we should have a desire to make Christ known to the uttermost parts or the world! Right now there is someone out there who needs the Lord. You can have the awesome privilege of being the one God uses to share the GOOD NEWS. 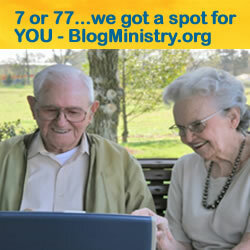 If you know of other resources for Christian Blogging please post them in the "comments". Also I have just begun work on www.internetminister.org . This is a site to encourage and empower YOU to share your faith. There is a special emphasis on developing evangelistic bridge web sites. What would the Apostle Paul think of the virtual world of "Myspace"? First for those over 30 - a little myspace Q & A? An online social networking meeting / hang out place. Members have their own webspace to post pictures, write blogs, listen to music, communicate with friends, meet new people, find out what's cool etc. More info HERE. Is "myspace" a real place? "For those who didn't grow up with the Internet, it might seem strange to think of a mere website as an actual place. But for people like Edstrom and Michael Edwards, a high school senior from San Diego who can't remember when there was no Internet, cyberspace is a real place, even if the entry gates come in the form of a PC. And at least these days, one's MySpace page is not just a home in that place, it's actually who they are online." Rest of the USA TODAY ARTICLE HERE. A thanks to Frank Johnson of strategicdigitaloutreach.com for pointing out this article. How many people hang out there? over 47 million! And growing rapidly. Mostly teens and young adults although other age groups are starting to increase. How much time are teens spending hanging out there? According to Bussinessweek.com the typical American teen hangs out there for nearly an hour and a half a day. What would Paul's response be to this? Go to www.myspace.com , use their search bar and type in your hometown. Then browse through the profiles. You will be shocked at what you see and read. I can't describe it, pagan, is the first word that comes to mind. You need to see it for yourself - most church going adults have no idea where today's youth are. There is a strong peer pressure to list partying and drinking as one of your favorites activities. As you browse, soon you'll see the faces of kids from your church. More than likely, many of their profiles will be quite similar to the others you've seen. I guess they haven't realized that parents can also use the Web. May we see the world as God sees it. May our heart be touched with feelings and emotions. We have so many goals and plans for our lives, but what about having a passion to make a difference? We must go where the people are. Today's "marketplace" and "Mars Hill Meeting places" must include places like myspace.com. It amazes me how most church attenders can see the need to hire a full time Youth Director to minister to 50 - 75 teens. (I agree your own kids must be the priority.) Then, they just can't wrap their brain around the concept or need for there to be FULL TIME Internet Ministers to reach out to the MILLIONS of teens who daily spend hours on the Internet. It is obvious that most churches can not support a full time Internet Minister. Yet I ask, "why is so hard for Internet Ministry to be a small part of their mission budget???" A church will raise money to send someone to an inner city park to talk with some teens and to try to share the gospel with a few. Why can't the church catch a vision to send a missionary to "myspace.com", to strategically share the gospel at the world's largest teenage hangout place? STEP 5 - PAUL ENTERED INTO DISCUSSION WITH TOTAL STRANGERS. It may seem like a chance meeting, but God knows who is searching and will set up divine appointments for all those who are willing to share their faith. Remember it's just our job to share. Going "live" in April of 2006 - please pray for (& help?) these efforts. 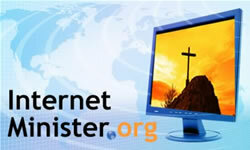 In April of 2006 www.InternetMinister.org will be a place where you can get training on how to share your faith online. We will also be providing practical opportunities to share your faith. We are in the process on lining up volunteers who would like to help us with this. Please drop me a note or sign up for our newsletter if you are interested. Right now you can go to http://internetministry.info to get valuable tips. STEP 6 - PAUL USED PRACTICAL WISDOM WHILE SHARING HIS FAITH. Paul's message was never watered down or compromised. Paul did find ways to connect with his audience. He found ways to relate with them and their unique culture. As an Urban Missionary I interact with many different cultures. It is important when we share our faith we take into consideration the culture we are entering into. We must think through what are the clear Biblical absolutes and what are our personal preferences. As an example, for many years I have been preaching at a Chinese church and also African- American Urban Churches. It is easy for those who are really emotional and expressive in their worship style to judge those who are not as unspiritual - "their faith does not even touch their soul, God has been soooo good to me, I can't help but to shout." Their goal in ministering must focus on sharing the GOOD NEWS, not trying to get the other group to worship the way they like it. On the contrary, those who are deeply contemplative may judge the expressive ones as being too emotional - in need of superficial cheerleading. Just because something is true for ourself (I'm not talking about God's absolute truth) does not mean it's true for others. Effective ministry takes place when we, with God's help, shed our cultural biases and personal preferences and share the GOOD NEWS in the context of the culture we are ministering to. I heard a minister teach that you were compromising (bad to him) if you used an overhead projector to sing songs instead of a hymnal. On the other extreme I went to a large church that was doing a great job sharing their faith in a way that the youth could enjoy and relate to. Yet I was personally offended that they used a video clip that included adult humor as part of their efforts to connect with the "seekers". We can deeply connect with people in the context of their culture without lowering any God given standard of holiness. This blog is about to become a book so I better close for now. 68% of teens say religion is important to them and 92% say they want a better connection with God. Wow this sounds like Athens - ripe for revival... now what do you think? Scott Reese Web Evangelist, Internet Minister. Other words for the search engines: Internet Ministry, Web Evangelism, Internet evangelism, Christian websites, ministry opportunities. Also want to say thanks to adaptivepath.com for an article on their site that was helpful for this blog.